As we say goodbye to summer and usher in the cooler months of fall, we also prepare ourselves for the traditions of the season. For some, those traditions are apple picking, hay rides, and gatherings with family and friends, while others may dream of starting brand new traditions in a new home this fall. However, many people do not believe they can make their dream of homeownership a reality due to student loans. Are your student loans holding you back from owning a home? If so, maybe Maryland SmartBuy can help. What is Maryland SmartBuy 2.0? Maryland SmartBuy 2.0 helps homebuyers with qualifying student debt purchase a home. If you have existing student debt with a minimum balance of $1,000, Maryland SmartBuy financing provides up to 15% of the home purchase price to pay off your outstanding student debt, up to a maximum program benefit of $40,000. With this revolutionary program, home buyers can choose from any eligible home available for purchase in Maryland that meets the Maryland Mortgage Program guidelines. Am I eligible for SmartBuy 2.0? The full student debt must be paid off at the time of the home purchase, and homebuyers must meet all eligibility requirements for the Maryland Mortgage program. 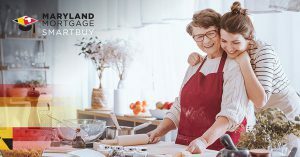 However, if there are multiple borrowers on the loan, only one of the borrowers needs to completely pay off their student debt using the SmartBuy forgivable second loan. Additionally, SmartBuy participants must live in the home for at least five years to fully achieve the loan forgiveness benefit. If you think that Maryland SmartBuy can help you achieve homeownership, don’t delay! Funding for the program is limited. Homebuyers are required to use an approved Maryland SmartBuy lender. Start creating new traditions in your new home today by contacting a lender!